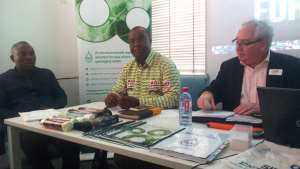 The Ghana Plastic Manufacturers Association (GPMA) has urged its members to use one per cent Oxo-Biodegradable (OBD) additives in the manufacture of plastic materials. The use of oxo-biodegradable additives helps the plastic products to degrade within a short period of time. Ebbo Botwe, President of GPMA, speaking at a symposium held recently in Accra on plastics, disclosed that plastic waste contribute about 14 per cent of waste generated in the country. Mr. Botwe said there have been calls from civil society organisations and some stakeholders to the government to ban the use of plastics in the country. He said: “We provided about 7,000 special plastic waste bins to help curb the indiscriminate damping of waste”. Perry Higgs, a senior scientist at Symphony Environmental Limited, said the use of oxo-biodegradable additives creates faster and more complete degradation which leads to biodegradation. Godson Cudjoe Voado, chief programme officer of EPA, averred that stakeholders met to look at previous studies conducted and recommendations from such reports to guide the sustainable management of plastic waste in Ghana. Mr. Voado said that plastic waste has led to the pollution of landscapes, beaches, oceans, lakes and rivers, as well as destruction of the spawning grounds of fish, adding that its negative effect on fish stock, water bodies and land is worrisome.